“It lies in the [life-supporting] habitable zone, and it could have an ocean at its surface,” Michel Mayor said during the European Week of Astronomy and Space Science conference. First discovered in 2007, Gliese 581d was originally calculated to be too far away from its host star—and therefore too cold—to support an ocean. But Mayor and colleagues now show that the extrasolar planet, or exoplanet, orbits its host in 66.8 days, putting it just inside the cool star’s habitable zone. At the same time, Mayor and colleagues announced that they have spotted a fourth planet orbiting in the Gliese 581 star system—and it’s the lightest exoplanet found so far. 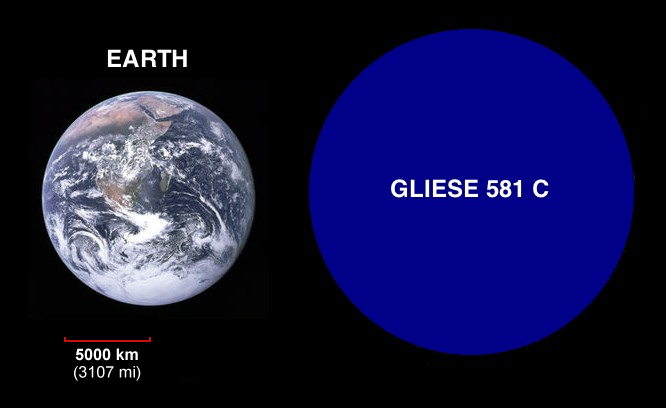 The planet, dubbed Gliese 581e, is only about twice the mass of Earth and is the closest planet to the star, completing its orbit in about 3.15 days. There are an estimated 10 billion planetary systems in our galaxy alone, yet to-date, only a few hundred have been discovered. Exoplanets are very difficult to detect because they don’t emit any light of their own and are completely obscured by their extremely bright parent stars. Normal telescope observation techniques cannot be used. Instead of trying to image/detect exoplanets directly we look for the physical effects they have on their parent star such as shifts in position or changes in brightness. The SuperWASP(Wide Area Search for Planets) technique involves two sets of cameras to watch for events known as transits, where a planet passes directly in front of a star and blocks out some of the star’s light. From the Earth the star temporarily appears a little fainter. The SuperWASP cameras work as robots, surveying a large area of the sky at once. Each night astronomers receive data from millions of stars. They can then check for transits and hence planets. The transit technique also allows scientists to deduce the size and mass of each planet.